Yesterday’s daily chart for the usd to cad pair hinted at the dollar carnage that we are currently witnessing with yesterday’s candle ending the session as a wide spread down bar closing well below both the 9 and 14 day moving averages but marginally above the 40 day where it seemed to have a modicum of support. With greater risk tolerance returning to the markets on the back of the Goldman Sachs results and better than expected fundamental news on the economic calendar for the US Dollar (in particular the PPI numbers with their hint of inflation expectations) this can lead to further Dollar weakness. 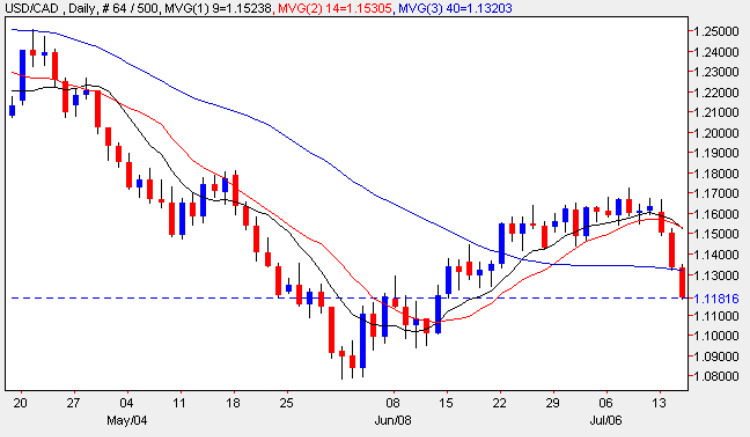 The strongly bearish sentiment has continued throughout today’s trading session and following the breach of both the 40 day moving average and the 1.13 price handle referred to in yesterday’s commentary, we should see a re-test of the 1.08 price point sooner rather than later. With most of the fundamental news on the economic calendar for the US already released and with a positive outcome for all the major numbers today, the markets are now waiting for the FMOC minutes to be released in the next hour or so which should offer us so further trading opportunities. My trading suggestion for this pair is to look for short positions using the hourly charts and using tight stops.